Let’s just have another “oh my goodness I love western Virgina” gush moment for a minute. Just look at those veggies! And all procured two blocks from my house! Local, organic, fresh, absolutely beautiful: what’s not to love about this town? Sure, it was pouring rain (I ended up driving instead of walking, sigh), but I counted five or six farm stands along with the sprouted grain bread maker, the cheese monger (who chided me for not eating cheese–it was an awkward conversation because he was such a nice old man and I hated breaking his heart), and some other little vendors. I love the Floyd farmers for selling together at one big table–sharing market space is such a great idea because you can feature more produce at once and everyone wins because more customers visit the lush and varied tables. Come to think of it, I need to go check out Floyd soon. I’ve been reading Fred’s blog for several years now and the area seems so welcoming and beautiful. Ok, so now that we’ve covered the awesome veggies, onto the recipe. So I didn’t hike McAfee’s Knob without some sustenance, I’ll have you know. In fact, I stayed up later than I should have the night before (which is why I overslept) in order to make some snacks for the trail. Being the bread fiend that I am, I knew I wanted something carby and substantial–I mean, trail mix is nice, but I like something to chew on–so, given the time constraints I decided to make pita bread. Now, I made pita bread regularly a couple of years ago, but the recipe never turned out quite right. I was never able to get fluffy air pockets and the pita always seemed dried out after a couple of days. This time I decided to go with The Fresh Loaf’s recipe because it looked easy and foolproof (two things I certainly believe in). I subbed some whole wheat flour of AP flour, but otherwise followed the recipe to a T. Every little pita round turned out perfectly: each poofed up in the oven and then when deflated and cool, each was soft and yeasty, slightly chewy–essentially exactly what I wanted out of the bread. Slathered in peanut butter and apple butter, the whole wheat yeasted goodness was just what I wanted while I lounged on the edge of a rock outcrop and surveyed the Virginia valley. Add the yeast to the warm water and sugar. Allow to sit for 10 minutes until foamy. In a mixing bowl, combine the flours and salt. Stir in the olive oil and yeast water. If using an electric mixer, use the dough attachment and mix at low speed for 10 minutes. If kneading by hand, turn out the dough onto a floured surface and knead for 10 minutes, roatating the dough 90 degrees with each stroke. After the dough has been kneaded, place the ball in an oiled bowl and cover with a moist towel. Place in a warm (but not hot) location (I like to use my oven if it’s turned off) and allow the dough to rise for 90 minutes, or until doubled in size. When it has doubled in size, punch the dough down to release some of the trapped gases and divide it into 8 pieces. Roll each piece into a ball, cover the balls with a damp kitchen towel, and let them rest for 20 minutes. This step allows the dough to relax so that it’ll be easier to shape. After the dough has relaxed for 20 minutes, spread a light coating of flour on a work surface and place one of the balls of dough there. Sprinkle a little bit of flour on top of the dough and use a rolling pin or your hands to stretch and flatten the dough. You should be able to roll it out to between 1/8 and 1/4 inch thick. If the dough does not stretch sufficiently you can cover it with the damp towel and let it rest 5 to 10 minutes before trying again. Open the oven and place as many pitas as you can fit on the hot baking surface. They should be baked through and puffy after 3 minutes (I was able to fit 2 in the oven at a time on the baking sheet). Allow to cool, the serve or store! Lovely veggies and such tasty looking pita! I’ve tried making pitas before but they turned out really dry. Yours look perfect! I’ll give this recipe a go. Mmm, I can see it now… hummus, tomato, sprouts, cucumber… thanks for the inspiration. I think Pita is the best bread in the world. I must make my own soon! so amazing!! i love local produce and i’m sad to see all the summer veggies and fruits slowly start to fade…ahhh the changing of the seasons. i like your pita recipe. i need to buy more yeast so i can make some! i’m so glad you’re enjoying western virginia so much, Jes! isn’t it the best? the people, the mountains, the fresh air, and all that nature is the best! i love the summer mornings when it’s really foggy outside – that’s my favorite! i went home to my parents place in goode (just 30 minutes away from roanoke) this friday & saturday for a bit – they have 5 acres & a view of the mountains – i absolutely it out there! 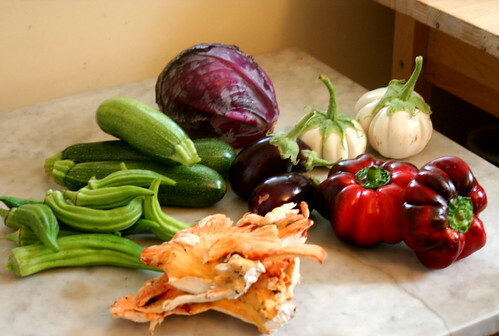 those pimento peppers look awesome & i’ve never tried white eggplant – i’ve yet to see it around here. totally gonna have to search around the farmer’s market next week & see if i can suss some out. slightly chewy ‘n super soft pita bread with pockets really is perfect – i’m gonna have to make some pita bread for dan super soon & i’ll fo ‘sho be using your recipe! thanks! I never made my own pita before. Your recipe sounds a lot easier than I would have expected. I have a whole wheat pita recipe I’ve been eyeing in one of my cookbooks, it sounds a lot more complex than your recipe. If I decide to make my own, I think I’ll try your recipe instead! mm… such great hiking food!!! 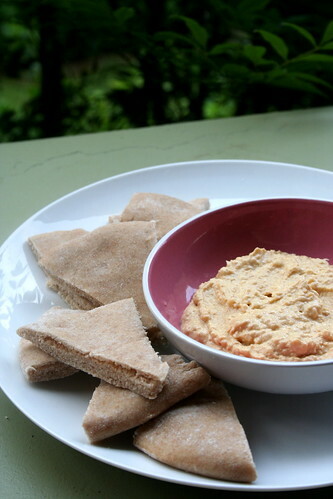 I’ve been obsessed with nut cheese lately so I’ll definitely have to give this pita recipe a go! That pita looks awesome! Inspirational: we’ll have to give it a try! I’ve never made pitas before, but you make me want to try. Your farmers market is nice. Chicken of the woods is my very favorite mushroom. I haven’t had any in a long time – jealous! Oh wow, those tomatoes! They’ be perfect with pita, for sure. hmmm…that definitely makes me want to make pita again. after you make it though, it’s so hard to go back to eating the bagged kind. Looks like you are really enjoying Virgina. Im glad. Nice veggies. Im jealous. Holy crap that produce looks gorgeous! And yes, it’s incredibly sad that ovens actually come with a “chicken nugget” setting. It’s a flippin’ oven…not a microwave haha. Good ovens make such a difference, though. I had the opportunity to use an amazing beast of an oven in a kitchen I used to rent, and the heat distribution alone makes a huuuuge difference. Pita is so much fun to make, I love watching it puff up in the oven! It’s been a while since I’ve made it though, thanks for reminding me.